When Phacelia franklinii (Franklin’s phacelia) was listed as special concern in 1996, there were only four documented records of the species from Minnesota, all were from the northeast corner of the state (Laurentian Mixed Forest) and dated prior to 1951. The lack of current data or systematic surveys prevented it from being assigned a more protective status at that time. Now, after years of targeted field studies by the Minnesota Biological Survey, only seven additional populations have been documented in the state (Lake and Cook counties; Northern Superior Uplands Section), and none of the previously known populations were relocated. Furthermore, all but one of the extant populations is extremely small, consisting of just 1-10 individuals each. Since the species is relatively large and conspicuous, it is unlikely that it has been overlooked during surveys or that many additional populations will be located in the future. For these reasons, the status of P. franklinii was elevated to threatened in 2013. Phacelia franklinii is the only member of its genus to occur in Minnesota; nothing else in the state looks similar. It has stems that grow to about 60 cm (2.0 ft.) tall. The leaves are pinnately parted, with many lanceolate or oblong-linear lobes that are often cut-toothed. 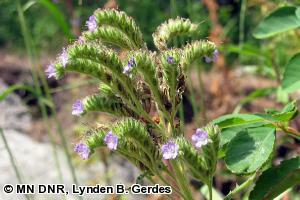 The flowers are bluish to white, subsessile, and arranged in a hairy, short and dense spiraled raceme. The Minnesota records of P. franklinii are from a number of slightly different habitat types, though most are near lakes and all are within northern fire-dependent forest systems. Known habitats include cliffs and talus, tip-up mounds, and rock outcrops. From a vegetation perspective, all of these can be considered early successional or primary habitats. When searching for this species, it might be wise to also consider lakeshores, and riverbanks as potential habitat. They all seem to reflect the requirement of this species for small gaps in vegetation caused by stochastic or seasonal disturbance. Phacelia franklinii is a northern species, requiring long days to stimulate flowering (Gillett 1963). Apparently, day length south of 45° north latitude is inadequate for the purpose. Flowers are pollinated by flying insects, particularly bees. Seeds are small and possess no specialized structures for dispersal. They are likely eaten by seed-eating birds and small mammals, which may spread the seeds during their feeding or caching activities. As is typical for annual or biennial species, P. franklinii occurs in narrow ecotones or small patches of disturbance, where there is direct sunlight and little root competition. Such disturbances are often caused by a single tree tipping over or a single boulder falling from a cliff. They do not have to be large areas of disturbance caused by storms, fire, insect infestation, or logging. A stable late successional forest community, of the type that occurs in northeastern Minnesota forests, appears to offer enough of these small disturbance habitats for a metapopulation of P. franklinii. Forest fires may also play a role in habitat creation and maintenance; however, that possibility has yet to be demonstrated. It is generally believed that P. franklinii requires soil disturbance within its forest habitat in order for its seeds to germinate. However, large scale disturbances, such as clearcutting or mining appear to have the opposite effect because they eliminate the greater habitat in which the species' microhabitat occurs. There is very little that can be done in terms of active management for P. franklinii, but if large landscape mosaics are maintained in a relatively natural condition, the species should be able to find habitat and sustain itself. Invasive species, including Centaurea maculosa (spotted knapweed) and several non-native Hieracium spp. (hawkweeds), are becoming more abundant in P. franklinii habitat. This is caused primarily by activities using heavy machinery, such as road grading, logging, and construction projects. The best time to search for P. franklinii is when flowers or fruits are present, from early July through the end of August. Most of the habitat of P. franklinii is within the Superior National Forest. That fact, in itself, does not denote any active conservation effort; however, it does open the possibility for future conservation actions. Gillett, G. W. 1960. A systematic treatment of the Phacelia franklinii group. Rhodora 62:205-222. Gillett, G. W. 1963. Flowering responses and phylogeny in the Phacelia franklinii group (Hydrophyllaceae). American Journal of Botany 50(8):798-801. Judziewicz, E. J. 1997. Franklin's phacelia (Phacelia franklinii (R. Br.) A. Gray) (Hydrophyllaceae) on Isle Royale (Michigan) and in the Lake Superior region. Michigan Botanist. 36:73-77. Penskar, M. R. 2008. Special plant abstract for Phacelia franklinii (Franklin's phacelia). Michigan Natural Features Inventory, Lansing, Michigan. . Accessed 5 November 2009.